the peninsula, the U.S.-Russia border passes through a narrow channel between Little Diomede Island (U.S.) and Big Diomede Island (Russia). Several small mountain ranges roughen the landscape, divided down the middle by the Koyuk River, which flows west to the sea at Port Clarence and the town of Teller. Gold brought non-native settlers to the peninsula in 1898. On arrival, they found well-established settlements of Malemiut, Kauweramiut, and Unalikmiut Eskimos. The areas history dates back thousands of years and is today in evidence at several locations including the Bering Land Bridge National Monument, which protects sites from the last ice age. The land and culture of the Seward Peninsula have been shaped in the last century by the collapse of caribou herds, the rise and fall of gold, the influenza epidemic of 1918, and World War II. Nome is the clear base of operations in the region. Originally a gold-boom town, Nome now serves the surrounding villages and centers Alaskas largest independent road system (not connected to the continental network). 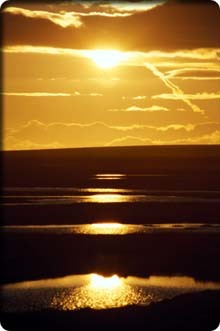 Kotzebue is the main town on the north coast. Visitors can enjoy mountain scenery, gold history, active native culture, parks, refuges, hot springs, and more.